Cupid's Dart is an old fashioned, summer blooming perennial. Catananche is derived from the Greek word for Love Potion, which along with the common names of Cupid's Dart and the Love Plant, refer to the plants usage in ancient times. narrow grey-green leaves that radiate out from the root crown. The single, 1"-2" flower heads appear atop leafless upright stems from early summer until fall. Cupid's darts are excellent for flower arrangements and as dried flowers. They are well suited plants for growing in containers. Cupid's Dart plants are hardy in USDA zones 4-8. Plant them 12" apart, in light, well drained soil. Heavy, clay soils will decrease the useful life of the plant. Cupid's Darts should be grown in full sun. Water moderately but regularly until the plant is well established. 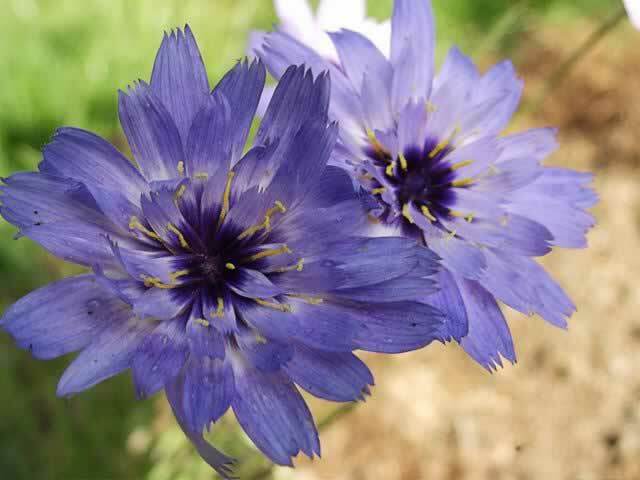 Once established, Cupid's Darts are fairly drought tolerant plants. Catananche plants can be propagated with root cuttings taken during the winter. Plants can be divided in early spring or in the fall. Sow Cupid's Dart seeds directly into the garden at mid spring, or start them indoors 6-8 weeks before the date of your last killing frost for blooms during the first year. Seeds started indoors should be kept at a temperature of 65°-75° within the growing medium. Germination will take from 21-25 days.